Way more edges than the Deanston 10 PX. Edited 9 Days later: Gave it a way better rating. The 2008 tends to need quite some "air-time". The breakthrough was when I smelled on the (empty, dry) dram from the last evening. All the red fruits hit me. After giving it some air-time and with the old dram next to it, I started to smell them in the liquid version as well. Air does this gem a huge favor - still have to do some whater experiments though. Even a good meter away from the glass already seductive fruity-tart red wine notes flow in the direction of the nose. Closer to that it condenses on boiled red grits and strong Muscovado sugar, the alcohol provides a minty freshness. Completely untypical I have here a salty-oily spicy wort - very exciting! Then it is also back to typical Deanston with aromatic herbal honey and creme brulee with cooked pear, briefly furniture polish flashes on, and a touch of fresh black pepper tickles the nose. The strong alcohol is quite noticeable, but bearable. A true Deanston: fat sweet start with spicy herbal sweets, accompanied by hot chili peppers - the alcohol shows full presence! Then ripe redcurrants and raspberries, raisins, pickled Amarena cherries and juice oranges. The honey sweetness flatters briefly, before then quickly tannins and dry oak wood provide intense roasty aromas. Dark tart cocoa, coarse tobacco and deep black espresso determine the character more and more and make this Deanston seem much older than the nine years. Although water brings a little more fruit, but also emphasizes the bitter notes. In the middle-length finish, two flavors stand out above all else - caramelised fruit compote and tart wood, slightly malty sweetness and chocolate with a pinch of clove remain the longest. rather medium to long, with red fruits, honey, spices and cooked almonds. Very intense and incredibly sweet. Dark honey and oak alternate, although the alcohol is noticeable but not dominant. Warm raspberries and vanilla ice cream prepare for the first sip. The aromas of various peels of citrus fruits such as tangerines and lemons blend in and give the scotch a hint of acidity. Everything gets a little tighter with water and wet wood is added. The malt is so sweet and sticky. The first sip was very impressive. Of course, the vinous fruit notes are omnipresent. This Deanston is very present in the mouth. Not least because of the strong start. In addition to the fruits I notice dark chocolate, nuts, coffee powder, cinnamon and some alcohol, which is otherwise very well integrated. Again, the sweetness is prevalent, although the single malt is more and more dry and also slightly astringent. The finish is really long and very powerful and warming. The now slightly noticeable bitterness does not detract from the good overall impression. The scotch is a bit herbaceous in the after-taste, which I do not like so much, and here I find the disagreeable taste of Deanston 12 again, which could hitherto hide well by the Vollreifung in red wine barrel. With water, this herbal note is enhanced. Well. Really good. In my opinion, it does not work with water at all. Since that comes to me "deanstige" too strong. My rating should show, however, that I will still like to have him from time to time in the glass. But then only pure! Very nice whisky, from the youth is nothing to feel, on the contrary, you have just at the right moment released from the barrel, the whisky has already taken the Fassaromen, the oak is noticeable, but still discreet. Red berries, slightly sour, thus more currants and sour cherry. Worn by a beautiful vanilla note. Slightly malty. Milk chocolate. Lemons. Starts with sweet and sour berries, again the sour cherries and black currants. Now the red wine is there too. Vanilla, caramel and whole milk cola, some oak in the form of espresso. Medium-long, lightly sliced ​​remains on the tongue, the oak, the red wine and the lemon introduce themselves again. 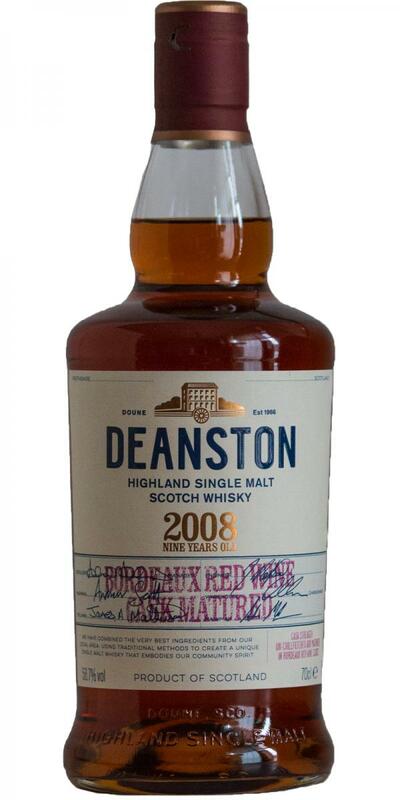 T he Deanston is an absolute surprise, delicious, fruity for me, sweet but with great power. He tolerates water and can deal with this super. You can really play with him and that's what I really stand for. Am thrilled. Yes, who gigantic if you give him another 3-5 years, a little rest and he would win nicely. The start has already surprised me a lot, I had the feeling to have a bourbon in the glass, the wine note was not as pronounced as I thought. Rather distinct caramel, vanilla and sweetness, fruity sweetness. I had a bit of alcohol in my nose, whisky was already in the glass for an hour, but it was still present. In addition very light furniture polish and some pepper. Then came the fruit flavors of cherry, red fruits and wine. Some wine is then there and the citrus freshness you get clearly. Exciting story, I have to say. H at one of the Deanston then once in the mouth, then goes off. Formally it occupies the whole palate, seasoning, again dark red berries - sour strawberries or cherries and pepper, intensive is here almost an understatement. Of course, this is also due to the alcohol strength, but really delicious. It has a great texture and comes later with a slight dryness. The spice comes from the wood as well as the vanilla. Light tobacco and leather notes underline the complete whisky with a dark. Overall, a little more wine expected, but not bad at all. I find this incredibly exciting and intense sweet. If you add 1-2 drops of water, the dark notes go away immediately and the berries appear clearer. He is much lovelier and still only a slight dryness. Again and again beautiful fruit compote, the pepper turns into a little chili and remains as sharpness but anything but unpleasant. The departure, however, is only so mediocre, but it does not matter, then I just take another sip. The combination of permanent smell and taste makes it truly a delicious whisky. On the palate, the maderized fruits stand out, as well as the sensation of alcohol very present .... it stings! then the almond a little cooked, cocoa with some cold tobacco. A dram really surprising, where the wine gives way to mixed fruits (red fruits and peach) for a surprising rendering !! Requires to be ventilated !! You see them more often nowadays: whisky’s finished or matured on red wine casks from France. 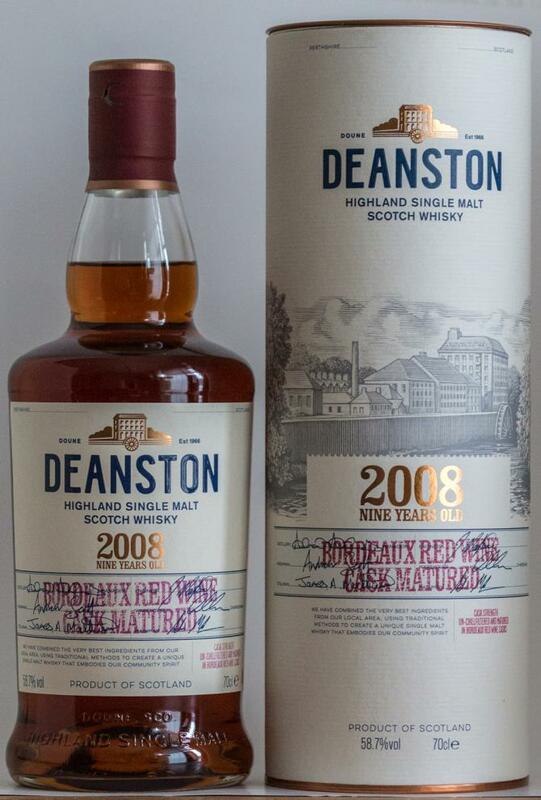 This Deanston from 2008 spent the whole 9 years on such a cask from Bordeaux and was bottled at cask strength in 2017. The nose bursts with red fruit, caramel, sniffing tobacco and red candy. Some furniture polish and blood oranges, but cherries quickly take the lead, followed by rhubarb. Softly spiced on pepper, some nutmeg and vanilla. Surprisingly rich and complex for such a young beast and the wine does not dominate, which I find quite pleasant. Kaboom! This is a kick to the teeth! The alcohol manifests itself prominently. Pretty piquant too. Pepper, chili, cloves, nutmeg and a hint of cinnamon. But then the explosion of fruit follows: citrus and mostly red fruit. Cherries, berries and the likes. Nicely sweet. The tannine of the cask counterfoots this, but the malt never turns oaky, nor winey. This is beautiful. And bottled at its peak, I’d say. Only in the long finish do I get the first inkling of the drying effect, but it remains sweet enough to be pleasant throughout. It dies a spicy death. Excellent marriage between the soft malt of Deanston and the wine cask. Top dram. 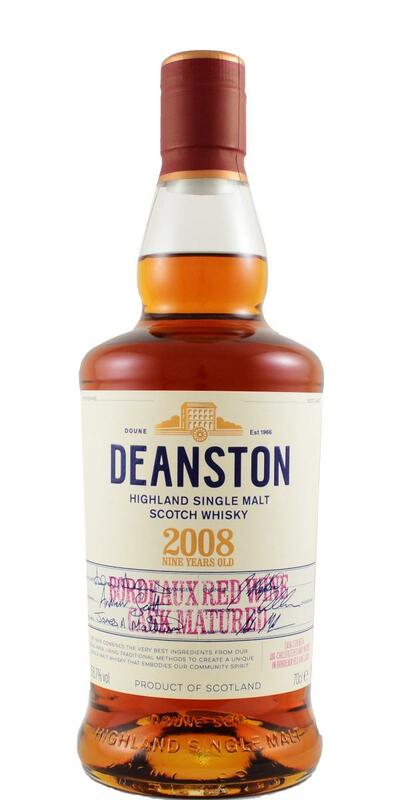 This Deanston was my second Deanston I tasted. A really very successful bottling. Sweet, strong, intense, long on the finish. Price-performance more than ok.